Alan and Heather got the last pumpkin in the store yesterday. 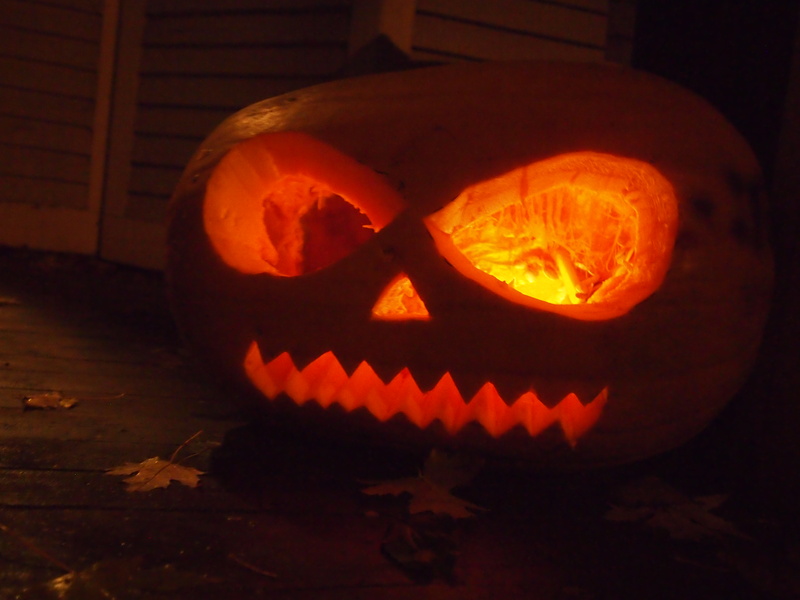 It was a huge pumpkin for $3.99, but it was a bit moldy inside….can’t have everything and the Jack-o-lantern only has to last a couple of hours anyway. Heather carved it a dusk and I think it looks great. A while ago I was saying to Heather that I would like to do a Santa hat nearer to Christmas. I got ‘MUM, Santa hats are NOT knitted, you might as well make a witches hat too!’. 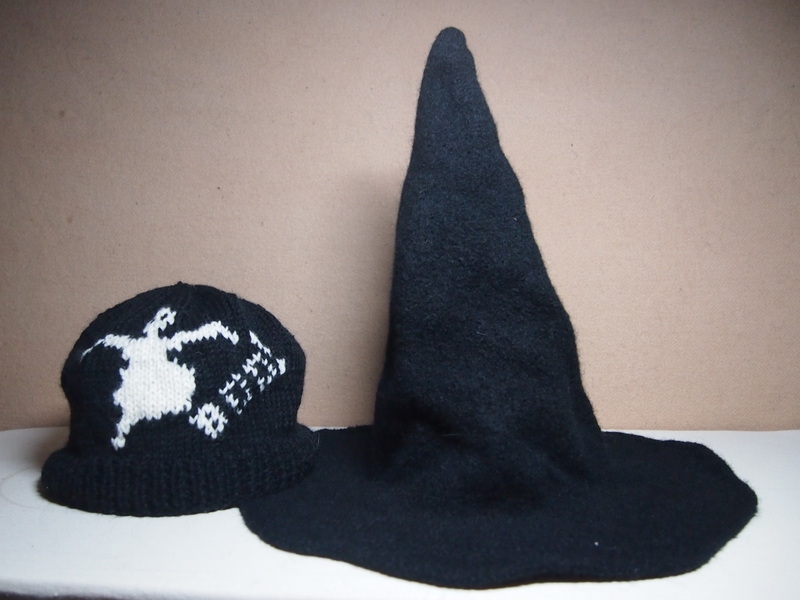 Of course, this made the idea of a felted witches hat pop into my head. I was making the witches hat till the last minute. It still needs some work to make the brim stay up, and I will decorate it a bit more. It is, however sort of the right size and shape, so that part is good. The washing machine ate my tension square. I made one. Honest. We looked all through the laundry last weekend and it had disappeared without a trace. I looked up what people said the shrinkage was for Patons Classic Wool then did the math and went for it. Here are the before and after pictures. Included in the picture is another hat that Heather calls ‘Penquin in a Hoop Skirt’. I should have followed my own advice and ripped it out when I noticed I had put and extra stitch in the ghost’s belly, but the intarsia was causing me grief and I didn’t want to redo it. So, to sum up, a bare pass and an epic fail…. This entry was posted in felting and tagged felted hat, felted witches hat, Halloween, Jack O'Lantern, knitted hat, knitting, Knitting and Crochet, Patons Classic Wool, witches hat on October 31, 2013 by gillianknitter. The whole time I was making this hat Alan (this is him in the hat for those of you who don’t know him) and Heather insisted that it looked nothing like a pumpkin. The colour was just plain TOO WRONG. 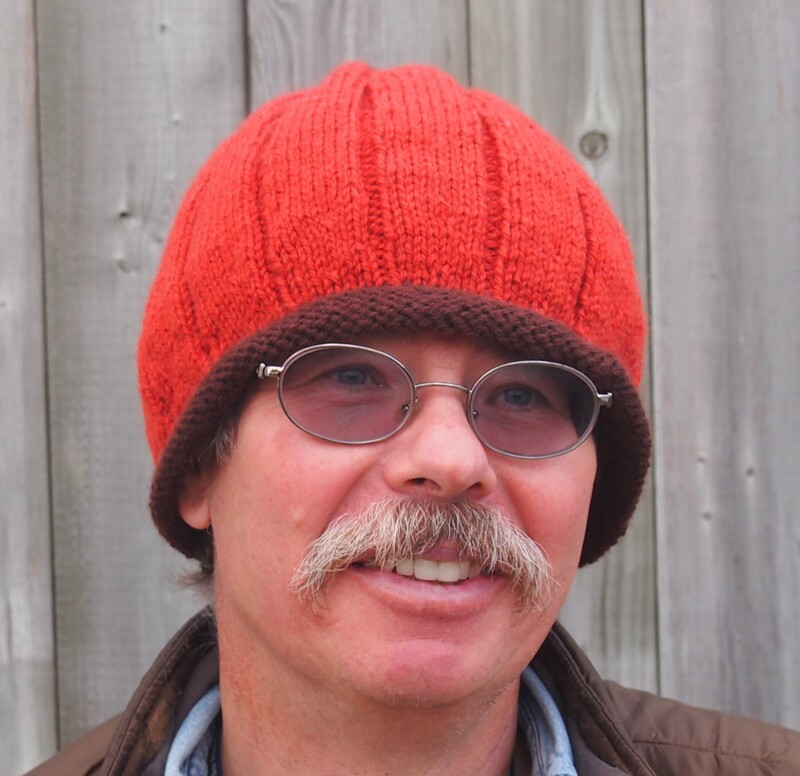 Alan thought it may end up being okay as a hat, and the colour was OK as a colour but it DID NOT LOOK LIKE A PUMPKIN. I actually think it does. So there. 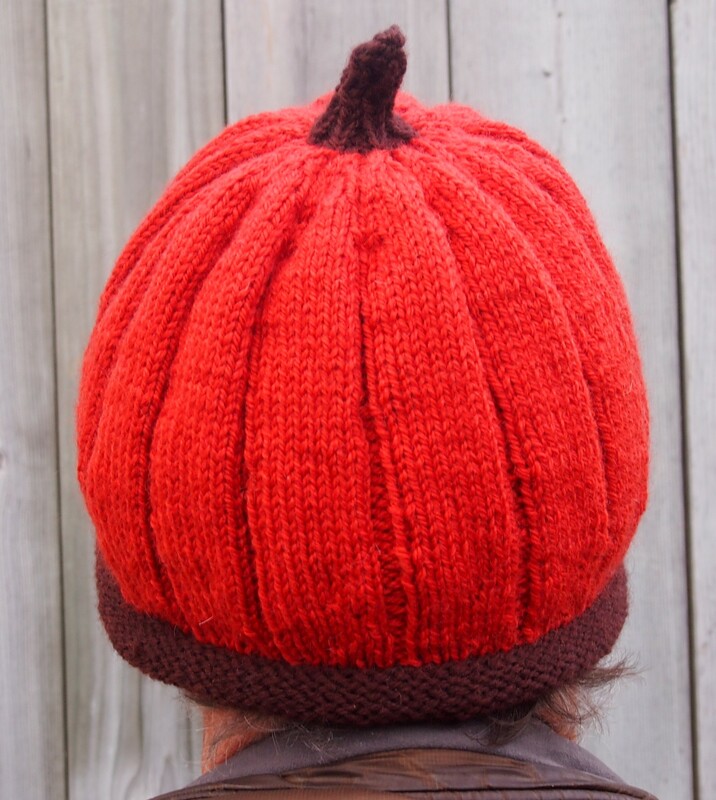 This entry was posted in sculptural and tagged Halloween, knitted hat, knitting, Knitting and Crochet, Pumpkin, pumpkin hat on October 29, 2013 by gillianknitter. This is the third in the series I made last week for Halloween. My nephew Jay was very impressed when I started it in the evening and had it finished when he got up. And no, I didn’t stay up all night. It is just that it is pretty much straight knitting with a few rows of ribbing and a few rows of colour work, so it only took a few hours. If you haven’t taught yourself how to hold one colour in each hand to do colour work, I would highly recommend figuring that out. Here is a silent video that shows it. Lucky you guys, I had to figure it out for myself (decades ago pre internet)! 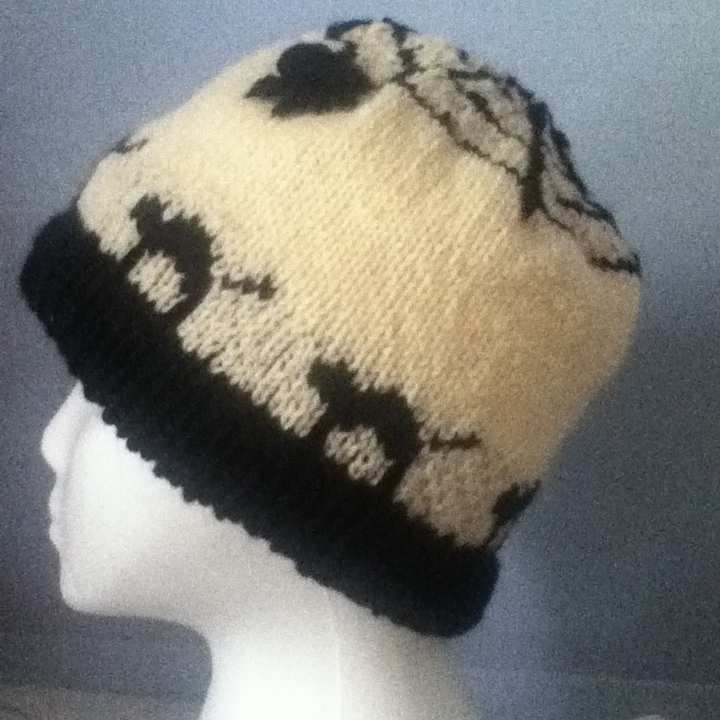 I did a spiral on the top because there was nothing else I really wanted to ‘say’ for the top of the hat. I think a spiral is a nice, simple ending that looks good without any topper, so it can be used on any hat to end quickly and simply, I chose to do a 6 arm spiral because there were three bats, so the spiral arms start above the heads of each bat and above the spaces between the bats. It is easy to figure out how make your spiral. It is a series of decrease rows separated by single rows of plain knitting. To figure out where to put the decreases, you count the number of stitches you have and divide by the number of arms in the spiral. If it is an even number then you don’t need a set up row. For instance, if you have 102 stitches and you want to do a 6 arm spiral, 6 x 17=102 and you need no set up row. The decrease pattern for this would be k15, k2tog around, k one row, k14, k2tog around, k one row.., etc,, so you are losing every 17th stitch around, then every 16th, etc. After the row that is just k2tog all round, you cut the end, thread through your stitches and draw it together. (n.b. make sure the leftmost of the two stitches you knit together is the same one that was the leftmost in the decrease below so they line up). If, on the other hand, you have 105 stitches, you will need a setup row to get rid of 3 stitches first. the set up row in this case would be k16, k2tog three times, then knit plain to the end of the round (effectively starting 3 of the arms one decrease early to get rid of your 3 extra stitches). 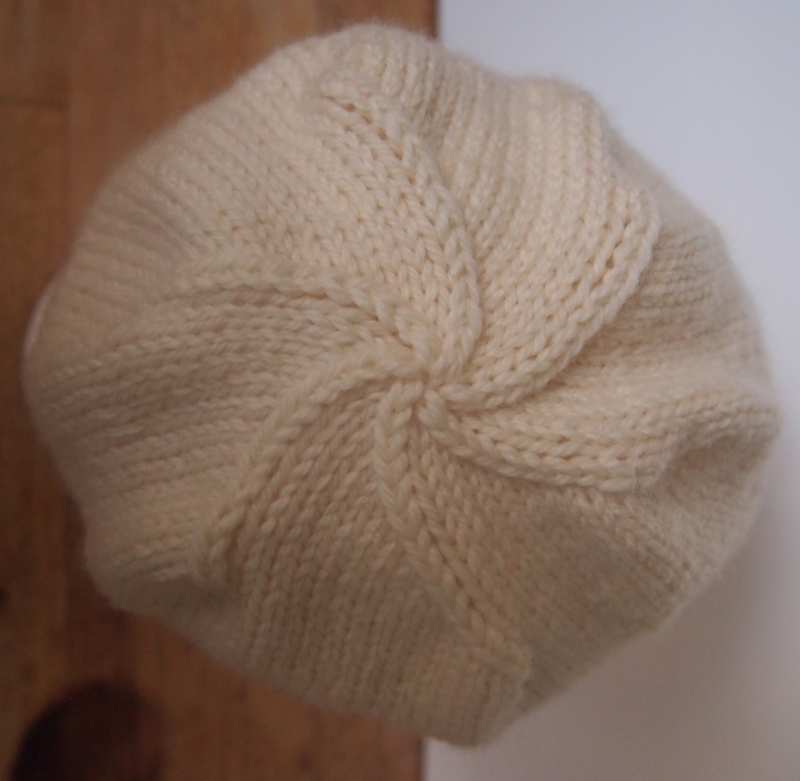 Knit one round plain before starting the actual spiral or you will have a jog in the end of your arms. I usually use 5, 6, or 7 arm spirals. A five arm spiral has a rounder top, and a 7 arm spiral, being more aggressive in the decreasing, will have a flatter top, ending the hat more quickly. 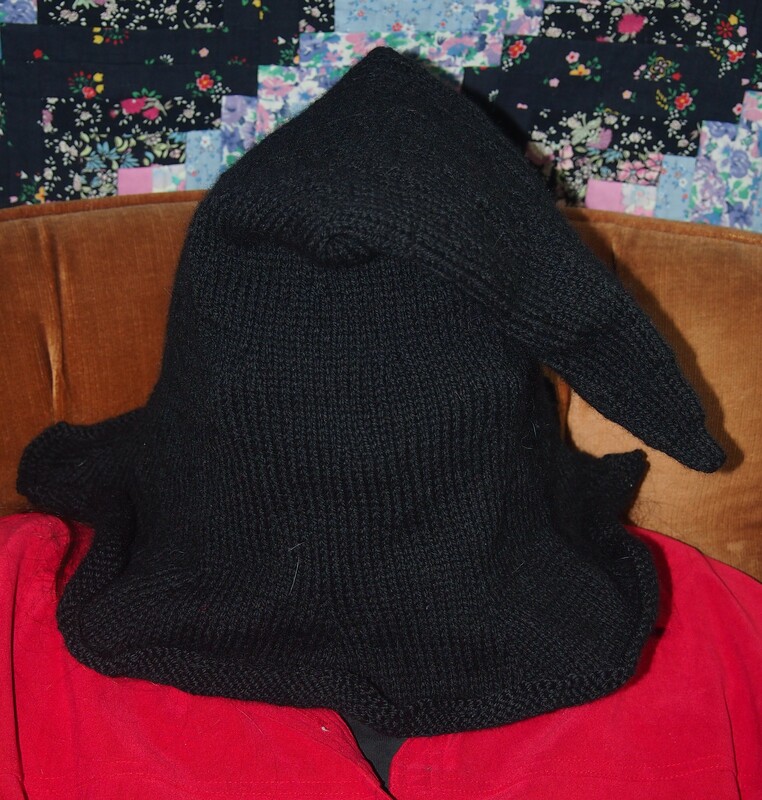 This entry was posted in knitting techniques and tagged bats, Halloween, knitted hat on October 24, 2013 by gillianknitter. This is the second of my Halloween hats. I was thinking about Halloween icons after the skull hat and I decided on the black cats. We actually own three cats and two of them, Domino and Shadow, are both pure black. 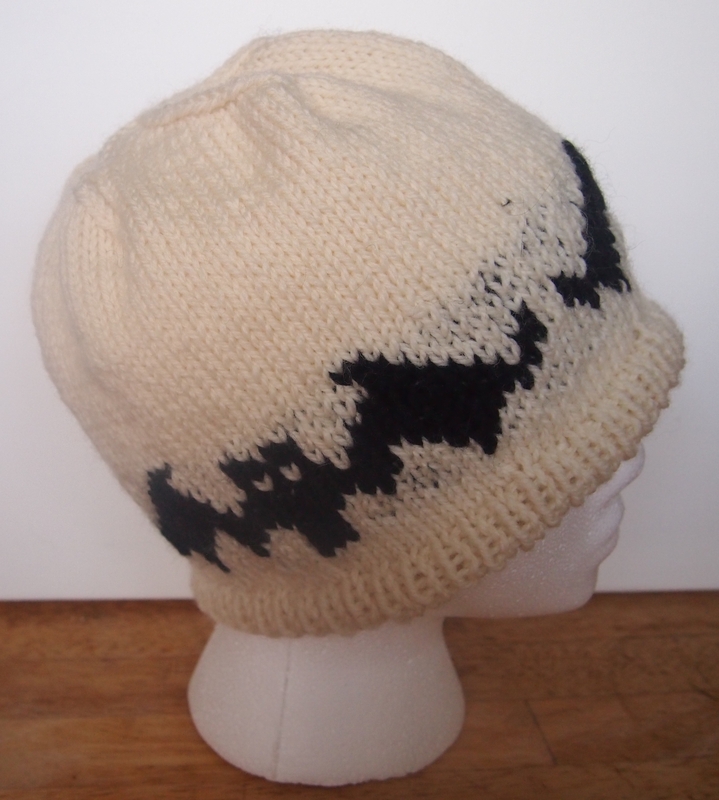 I am not sure the cats on this hat are all that great but it is really hard sometimes to pixelate a picture well when you are trying to work with only a few rows and stitches to fit into the hat correctly. Luckily enough we have all been trained over the years to recognize some iconic pictures so I am sure everyone knows they are black cats anyway. I felt that the hat needed some black near the top to balance all the black at the bottom, so I made the top into a spiderweb as I decreased. I also crocheted a spider and sewed her on the side. 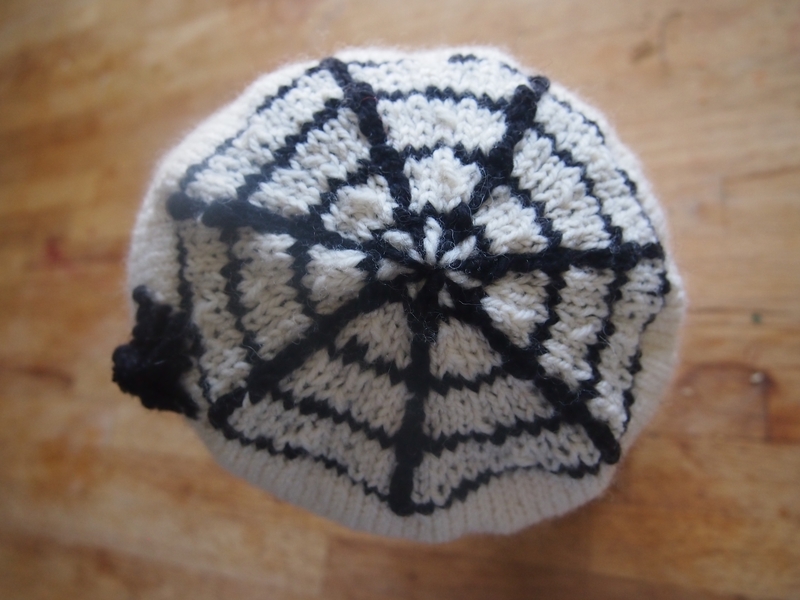 This entry was posted in Uncategorized and tagged black cats, Halloween, knitted hat, spider web on October 23, 2013 by gillianknitter.